Wales will miss Justin Tipuric on their tour of New Zealand in June, says former Wales captain Colin Charvis. The 26-year-old flanker has been advised to take a three-month rest after suffering concussion playing for Wales against Italy on 19 March. Charvis applauded the decision to give Tipuric a break and the trend towards caution in dealing with head injuries. "Better safe than sorry," he said. "There's plenty of rugby ahead let's just make sure [he] is looked after." "Ospreys will miss him for the end of the season and Wales will definitely miss him." Tipuric's region face an uphill struggle to secure top-flight European rugby next season and in June Wales will play three away Test matches against the All Blacks. Ospreys have played in the top flight European Cup competition every year since their inception in 2003, but are currently ninth in the Pro12 - three places and nine points outside the qualification places. 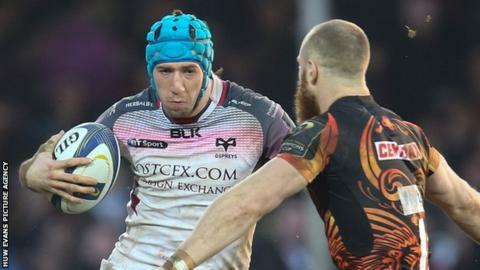 Tipuric is the second Wales international to be forced to take an extended break from the game following a head injury in the past 18 months. Wing George North was out of action between between March and September in 2015 after a series of blows to the head. Charvis, who played 94-times for Wales between 1996 and 2007, said the management of players after head injuries today is much better than when he was playing. "In my generation and before ignorance was kind of bliss then, wasn't it?" he said. "If you could walk in a straight line you could go back on the pitch and we don't know the long-term effects of all the concussions we had."